Bristowe (1958) described how the long-legged 'cellar spider' Pholcus phalangioides (Fuesslin, 1775) takes a heavy toll of other spider species entering buildings where the former have built their webs. Jackson & Brassington (1987) provided a fuller account of such araneophagic behaviour, while Roush & Radabaugh (1993) have discussed web size and density in relation to prey abundance. Pholcus phalangioides may be described as an opportunistic predator with the ability to modify its predatory behaviour and web structure when occupying human dwellings; incidentally, it is this adaptability which makes the species such a good laboratory subject. 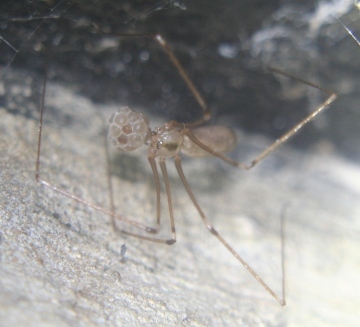 From April to September 2001, I monitored the diet of a population of Pholcus phalangioides occupying a disused garden shed in Aldershot, Hampshire. Prey items were removed from the webs and even from the chelicerae of the spiders at regular intervals. In total 102 prey items were collected: 63 were identified as Tegenaria domestica, and 6 as Pholcus; the rest were unidentifiable arachnid remains. Eight female T. domestica had built webs in the shed contiguous with those of the pholcids: all eight survived the study period, suggesting that, once established, they are less likely victims than newly entered individuals. Bristowe, W. S. (1958) The World of Spiders. Second Edition. Collins New Naturalist, London. Jackson, R. R. & Brassington, R. J. (1987) The biology of Pholcus phalangioides (Araneae. Pholcidae): predatory versatility, araneophagy and aggressive mimicry. J. Zool., Lond. 211: 227-238. Roush. R. S. & Radabaugh. D. C. (1993) Web density is related to prey abundance in cellar spiders, Pholcus phalangioides (Fuessllin) (Araneae: Pholcidae). Bull. Br. arachnol. Soc. 9: 142-144. Added by John Partridge at 15:57 on Thu 9th Feb 2012. The discovery of (possibly) the highest density of Pholcus phalangioides in Britain (Newsletter 83: 10) has led me to take a greater interest in these strange spiders. Like most arachnologists in southern England, I have a well established population of these spiders in my house. One large female specimen, which has taken up residence in a corner of an upstairs bedroom, regularly catches woodlice and flies in its extensive web which stretches for more than a square metre across the ceiling. About a week ago (early November 1999), I saw a large male Tegenaria positioned about 20 cm from the Pholcus on the wall and thought I would try a simple experiment. I moved the Tegenaria to the opposite side of the room, but by the following evening it had returned to its original position near the Pholcus (I am sure it was the same spider as it was missing its left hindmost leg). I repeated this procedure over the next six days and every morning it had returned to the same place. This morning when I looked, the Pholcus was busy sucking the Tegenaria dry! It had caught and wrapped its prey which must have been at least twice its size (by weight). Male Tegenaria are most common in houses in the autumn when they leave their webs in search of females. Presumably the females produce a pheromone to attract the males to the vicinity of their webs. The males then tap on the female web with their palps in a speciesspecific way to avoid being mistaken for prey. Is it possible that Pholcus could be 'hijacking' this system by mimicking the Tegenaria female pheromone to attract male spiders to its web? I know my experiment was not very scientific (n=1!) but I would be very interested to know if there have been any experiments performed to investigate this possibility. Added by John Partridge at 17:02 on Mon 9th Jan 2012. During a recent (summer 1998) family holiday in Cornwall, we visited the Museum of Submarine Telegraphy at Porthcurno, a fascinating attraction buried deep within the granite cliffs near to the famous Open Air Theatre. As part of the guided tour, we were shown the tiny beach hut where thick communication cables from all over the world emerge from the ground. During World War II, this site was of huge strategic importance and its location was a closely guarded secret. The hut is 2-3 metres square and has no windows; it is only opened a couple of times a week during the season and felt pleasantly cool inside. What particularly struck me about this hut was the extraordinary density of the spider Pholcus phalangioides (Fuesslin, 1777). I counted at least 200 large adults (there were many more juveniles), including some of the largest specimens of this species that I have ever seen. This population must have been isolated for many years, as there is no other suitable Pholcus habitat for some distance around the hut. The webs contained a variety of prey items, including earwigs, woodlice and millipedes. The genetics of an isolated group such as this would presumably make a very interesting study, and has the added attraction of being on one of the sunniest beaches in SW England! Added by John Partridge at 16:58 on Mon 9th Jan 2012. Anyone who has ever experienced close encounters with Pholcus spp. is well aware of the spiders' technique of disappearing before one's eyes by performing high frequency simple harmonic motion in the web. The cobweb seems to be well 'tuned in', and resonates quite happily, creating much confusion in the housewife, or other similar enemy. However, this resonance-show does not stop with Pholcus. Even Nephila clavipes (Linnaeus) exhibits this trick which, considering its size, is very impressive indeed. Actually, this web-bouncing constitutes a very common activity among most web-spinners, although they do not all bounce for the same reasons. When house-flies come into contact with spider silk, they seem instinctively to freeze, especially if they can feel the vibrations of a spider approaching. Agelena and Tegenaria spp. often counteract the fly by staying quite still as well. It is rather like submarine warfare: both vessels turn off their engines and 'listen', each waiting for the other to make the first move. Indeed, this 'stand-off' cannot last for ever, and if the funnel-web spider moves first, the fly is quite aware of its position, and therefore knows when to start struggling for escape. So the fly is in a dilemma: the longer it stays in the web, the more likely the spider will be to find it while on a general inspection, yet if it moves, it is in danger of being sensed. The spider counteracts by jumping in the web to scare the fly just enough to make it panic and start buzzing, revealing its location. Furthermore, the fly 'knows' that the spider cannot 'hear' the victim's movements while the spider is moving. Hence, one also notices the abrupt, periodic pauses that the spider makes while searching around the web, in order to 'listen' to the fly's vibrations. Although it is well known that the classic orb-weaver, Araneus diadematus Clerck, finds prey in its web by plucking and feeling the tension of the various radii, an orb-weaver such as Nuctenea umbratica Clerck uses quite a different method. As soon as an initial thud is felt through the web, N. umbratica, centred in the hub, shakes back and forth until the whole web oscillates; then the spider counteracts the shaking by reversing the swing. If the web is empty, it will become still. However, an insect with a relevant mass, will keep on resonating while the web is still, because the spider's counteraction was just enough to freeze the web, but not enough to stop the movement of something heavier. (This hypothesis still has to be proved using high speed cinematography). It is by this method that N. umbratica, although having poor vision, is capable of locating a stick or leaf within seconds after contact with the web. It actually seems that Linyphia triangularis (Clerck) uses a combination of 'scaring' and the 'sonar' methods stated above. In Spider Communication, (P. Witt & J. Rovner, eds, Princeton, N.J., 1982), Bertrand Krafft described (p. 49) how certain social territorial spiders keep conspecifics off their webs by tugging and creating vibrational movements to warn the intruder. Perhaps this communication signal originated from the ways in which prey is located as described above. Certainly, it is not too far a jump to connect the two ideas and therefore to assume that the 'sonar' location system was modified through evolution into a communication system suitable for social territorial spiders living in close proximity. Furthermore, although Pholcus spp. have not been referred to as fully social, they nevertheless show signs of mutual co-operation through their simple harmonic motion mechanism indicated above. In the cellar of my house, guests often refrain from decending to admire the wine collection because of the masses of cobwebs that line the ceiling. It is so very thick with Pholcus spp. that the webs are joined in a large mass. It happens that if the web at one end of the cellar is disturbed and the spider starts vibrating, the neighbour picks up the signal and so on until all the webs seem to be moving. In a way, the spiders have warned their neighbours of an approaching enemy. In certain respects this is a form of mutual assistance and communication: the bouncing effect in web-spiders may not be as simple as it seems, and probably should be explored by further studies. Added by John Partridge at 16:55 on Mon 9th Jan 2012. For some years now I have maintained in my laboratory at Furzebrook a culture of the stick insect Carausius morosus Brunner. Almost inevitably over the years these insects, especially when young, have escaped the confines of their rearing cages to the extent that there is now a small population living on the flowering pot plants on my windowsill, and not, I may say, without some damage to the plants. Across one corner of the window sill a female specimen of Pholcus phalangioides (Fuesslin) has spun a web and recently I have noticed that this spider has begun to capture and eat stick insects. So far, to my knowledge, this female has eaten three insects. The first of these was a second instar of about 20mm in length but the remainder were fourth instars at least 45 mm in length. It seems remarkable that such large insects should form the prey of this spider.